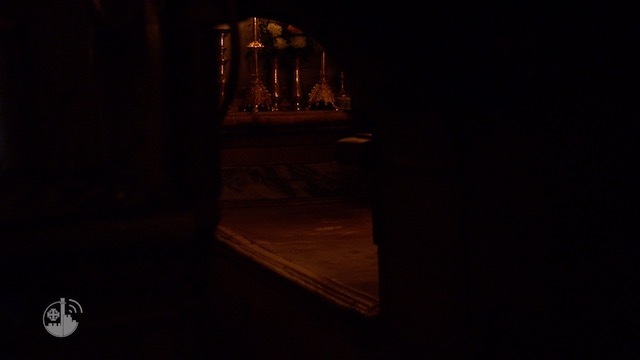 [From custodia.org] For the last two weeks visitors to the Holy Sepulchre have noticed a certain bustling around the “Chapel of the Franks”. Many visitors and pilgrims to the Holy Sepulchre don’t know its name, even though they have seen it. 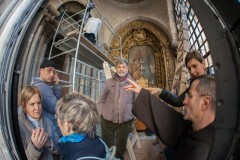 The Chapel of the Franks, whose real name is the Chapel of the Torment or Chapel of Our Lady of Sorrows or Chapel of the Seven Sorrows of the Blessed Virgin Mary, is literally against the basilica’s façade at the top of the stairs, a site where many groups of pilgrims will remember having taking the traditional souvenir photo. The restorations are being executed by young Palestinians who were trained at the Mosaic Centre Jericho, the mosaics school – founded by Fra Michele Piccirillo and directed today by arch. Osama Hamdan – with which ATS pro Terra Sancta has been collaborate for years. The same young people involved in Gethsemane’s project, have also been trained in cleaning the stone and restoration of the altarpiece. They will continue this experience with an internship in Italy to further hone their skills.